The Hotel Britania can be found in a 1940’s building designed by Cassiano Branco, renowned contemporary architect. The set of many stories, of heated conversations between the intellectuals and artists of the time, and of war time conspiracies featuring diplomats and spies, this hotel is worthy of your stay. Considered one of the most luxurious hotels in Lisbon, its design perfectly harmonises the Art Deco style with nationalist icons. This inheritance has been preserved, and the recent restoration and the antique furniture have enabled it to become listed as a building of historical interest. The walls and the floor in the hall are covered in marble and the resulting space is illuminated by the light of the opal and bronze stroked glass deco chandeliers. The wood panelled bar heightens the objects and furniture of yesteryear. The welcoming and relaxing lounge is an invitation to listen to good music, to contemplate the fireplace or to look at pictures that witness a past richly steeped in history. The spacious rooms also exhibit Art Deco furniture in harmony with modern textiles and warm colours. The marble bathrooms have been meticulously restored and include all the comforts that one has become accustomed to in present times. In this hotel one lives the tranquil atmosphere of the epoch and experiences the courtesy of service that has over 50 years of tradition in hospitality. Its location is ideal to set out in search of a Lisbon that is ancient and of the Lisbon that has been completely renovated. Located in Rua Rodrigues Sampaio which runs parallel to Avenida da Liberdade, in the historical centre of Lisbon. "This delightful hotel has a beautiful marble lobby." 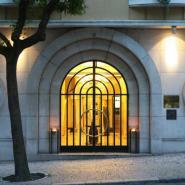 "Lisbon's only surviving original Art Deco hotel." "Occupying one of the few buildings from the 1940s near the Avenida da Liberdade to have survived unscathed." "Is one of the most traditional and refreshingly conservative hotels in Lisbon." "The original ambience has been restored." "Its 30 rooms are huge, but the overall atmosphere is very intimate." "Successfully restored to its elegant 1940s appearance, this landmark hotel designed by Cassiano Branco is both charming and comfortable." "Maintains its 1940s-art-deco feel, offering a clean and professional haven on a quiet street one block off Avenida da Liberdade." "Good-sized rooms and classic Art Deco interior." "This gem of a hotel was designed by Cassiano Branco - it is a true museum-piece of' 40s architecture and now ranks among Lisbon's classified buildings." "Built in the 1940s, the Hotel Britania is a well-preserved art deco." "Hotel Britania is a lovely hotel, the rooms are excellent, service was impeccable, the staff very friendly!"